Just about time for a beach! – Dontcha think? St. John can be equated to a car wreck. If you’re in one that memory stays with you a very long time. But most of us have short term memory loss and thankfully a lot of you have overlooked the aftermath that followed Hurricane’s IRMA and Maria. Since September the island has made an amazing recovery in every sense of the word. People both on the island and many like you on the mainland, came to the rescue of this tiny Caribbean Paradise. And as much as “we” have accomplished in less than seven months the overwhelming tide has been turned not by man but by nature. This first picture is of Trunk Bay taken December, 2016. Note how wide the beach is in this picture. Yea, and also see how many people that look like ants are on the beach. This second picture below is of the same beach soon after both Category 5 hurricanes in October of 2017. Pretty depressing isn’t it? No people, trees are stripped clean and trash lying about. Broke my heart and I wept when taking this picture thinking all the time, the island will never the same. Certainly not this most famous jewel in the Virgin Islands and top ten beach in the world. But wait! 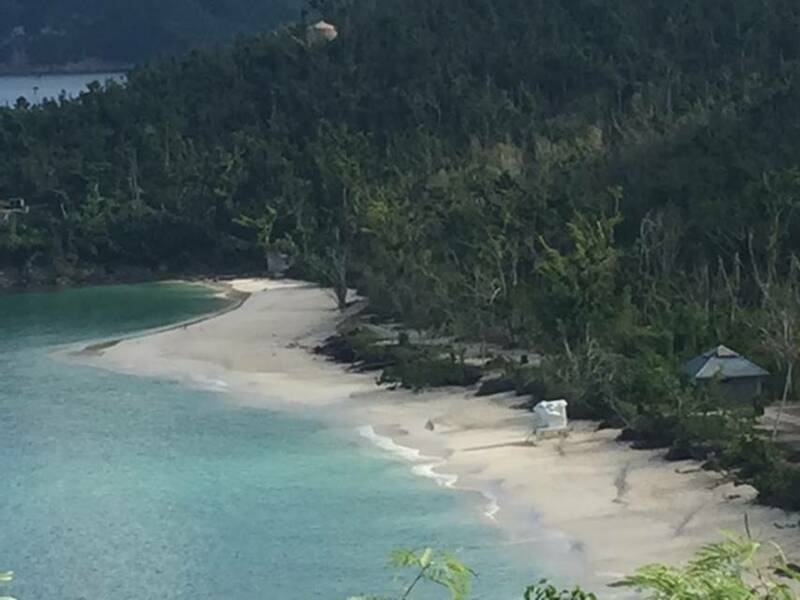 The picture below was taken January, 2018 by Jenn over at News of St. John shows the remarkable resilience of Trunk Bay in just four short months. Look at how much wider the beach has become. Now, you have a smile on your face. Oh, yea – I can see you’re in your “Happy Place” again 😊. Trunk Bay is just waiting for your butts in chairs and feet in the sand! Due to the effort of thousands of hours by volunteers, government assistance and National Park personnel from around the country, St. John has risen like a Phoenix from the ashes to once again take her rightful place as a most beautiful island destination. I thank each volunteer and every person that made this a reality. But most of all I thank Mother Nature and God for completing the restoration process in such a short span of time. I’ve had a ton of island questions lately and I appreciate them. Hope the following will touch on some questions you might have as a reader. Yes, all the beaches are open and looks like more turtles and fish than before IRMA! Yes, all the grocery stores are open. Yes, about 80% of the restaurants are open. Beach Bar will likely open late Summer if everything goes well. Car barges are running but often just one so rent on St. John and avoid possible hours of waiting. Yes, St. John is as safe as it’s always been with little or no crime. Yes, we do drive on the left! The Easter Bunny is around the corner and school will be out soon. A lot of villas are now fully repaired and awaiting your arrival. Have a great Spring and “I’ll Leave the Lite On” at your island home – Bordo Mare and Sopra Mare. Hope you enjoyed this more upbeat newsletter. Newer PostConfused! - Looking for the perfect villa? You are not alone! Older PostYou'll flip over this!